Habibullah presents his research to agricultural professionals at the Greenley Research Center 2016 annual field day in Novelty, Missouri. Photo courtesy of Peter Motavalli. Habibullah, who his friends call Habib, has no trouble recalling the moment he was notified of his selection to the Agricultural Innovation Program for Pakistan. 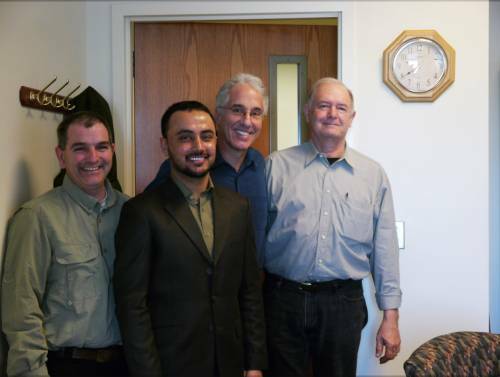 Habibullah stands with Kelly Nelson, Peter Motavalli, and Robert Kremer at his thesis defense presentation on Feb. 16. Pakistani graduate students. This partnership involves collaboration between the United States Agency for International Development (USAID), Pakistan Agriculture Research Center, International Maize and Wheat Improvement Center (CIMMYT), in Mexico, and University of California, Davis. The University of Missouri is one of six institutions that these scholars are currently attending. Habibullah will be the first graduate of this program to complete his studies at the University of Missouri, but some hope that it is only the beginning of a new partnership. Born and raised in Loralai, a district in the province of Baluchistan, Habibullah, who goes by a single name, says that his inclination towards agriculture began on the family farm. Seeing the relationship between agriculture and the environment and the importance of soil in agricultural production, ultimately led him to pursue a career in the field. Habibullah’s formal studies in agriculture began in 2009 while a student at Sindh Agriculture University in Pakistan. Following two years of general agricultural studies, he made the decision to spend the following two years specializing in soil science. It was during this period that he applied for and was selected by the U.S. Department of State to serve as a cultural ambassador of Pakistan. In addition to being a full-time student at the College of Southern Idaho, this exchange program allowed him to participate in campus and community-wide events to foster mutual understanding between the two nations. After his five-month tenure, he grew determined to return once again to the United States to earn his master’s degree. While preparing for the GRE and searching for scholarships that would allow him to further his studies, a friend introduced him to the Agriculture Innovation Program (AIP) for Pakistan. 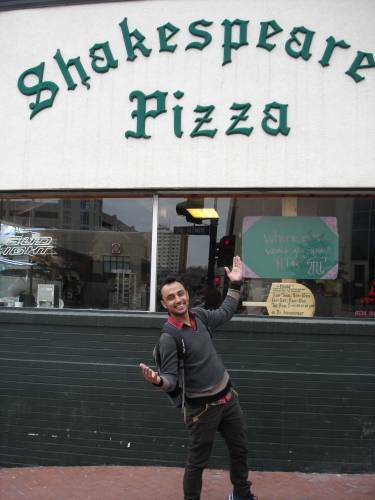 This would ultimately prove to be his ticket to continuing his education in the U.S.
Habibullah at Shakespeare’s Pizza in downtown Columbia. Photo courtesy of Linda Journey. Out of the 350 students who applied to AIP, nine master’s students and five doctoral students were chosen. While Habibullah was relishing his acceptance, Peter Motavalli, professor of soil fertility and plant nutrition, and College of Agriculture, Food and Natural Resources International Programs (CIP) were applying to host him. This consisted of a “bid,” sent to UC-Davis, outlining the resources and costs the university was able to offer. The other institutions that were selected were Washington State University, University of Minnesota-Twin Cities, Mississippi State University, Texas A&M University, and University of Massachusetts-Amherst. Students receive full coverage of tuition, books, and a monthly stipend and are committed to working for the government of Pakistan for two years after completing their education. In the midst of the bidding process, Habibullah had been discussing MU’s soil science program with Ahsan Mir Rajper, a former colleague turned Fulbright scholar at the university. Mir Rajper, had been Habibullah’s peer at Sindh in Pakistan and as it turned out, Habibullah would soon join his friend once again as a graduate student. Since arriving in Columbia two years ago, Habibullah has worked closely with his advisors, Motavalli and Kelly Nelson, research agronomist at Greenley Research Center, in Novelty, Missouri. Habibullah’s research has been focused on the management of nitrification inhibitors (chemicals designed to slow nitrification) to improve the efficiency of nitrogen use and to maximize corn and wheat yield. Beyond checking off his degree requirements, Habibullah has leveraged other opportunities to grow and learn. In November of 2015, Habibullah joined his professors and other graduate students in traveling to the Soil Science Society of America Conference in Minneapolis. Here, they gathered with more than 4,000 scientists to discuss advancements in their field, meet and network, and discover opportunities to give back and serve. 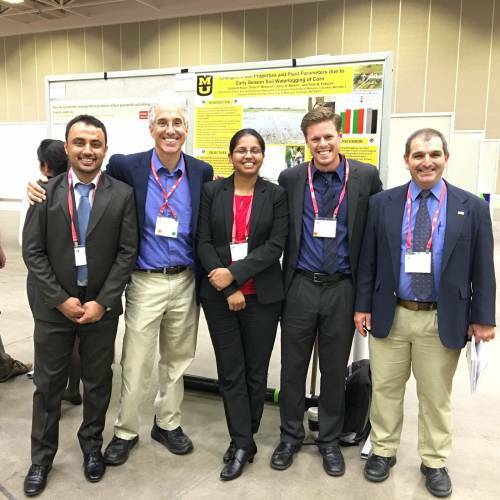 From left: Habibullah stands with Peter Motavalli, Gurpreet Kaur, Theo Bluemenschein, and Kelly … Expand ▸From left: Habibullah stands with Peter Motavalli, Gurpreet Kaur, Theo Bluemenschein, and Kelly Nelson at the 2015 Soil Science Society of America meeting in Minneapolis. Photo courtesy of Habibullah. Additionally, Habibullah has been actively involved with the annual field day, an educational outreach program, at the Greenley Research Center. Here, he was able to present applicable research to agricultural professionals. Academics, however, are only a part of the experience. The diverse culture of the university and the relationships built have been vital as well, Habibullah says. As Habibullah’s time at CAFNR nears to a close, his advisors reflect on his time spent here. Programs such as this one are mutually beneficial, Motavalli and Nelson noted. Students are able to receive an education, but in turn, their research and findings assist the university and are able to educate Missourians. Well-executed collaboration also engenders goodwill with both the sponsoring government agencies along with the individuals involved, Motavalli said. “To have these kind of programs is a long-term relationship,” Motavalli said. Ken Schneeberger, international training coordinator at CIP, pointed to the new interactions, discoveries and opportunities associated with hosting international students. He says that AIP, and similar programs such as the Borlaug Fellowship Program and the Cochran Fellowship Program, go beyond knowledge and learning and lead to global connections that may be utilized for years to come. 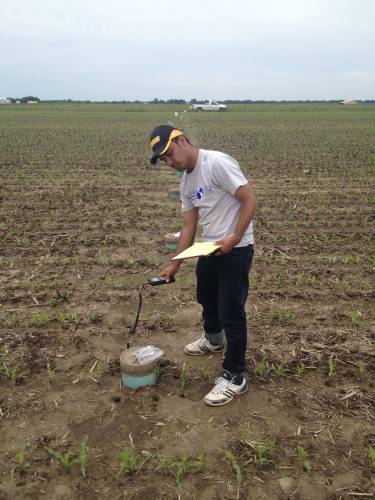 Habibullah measures soil temperature at the Greenley Research Center. Photo courtesy of Habibullah. “Our experience with other visiting scholars tells us that when Habib returns to Pakistan, both he and we at CAFNR, will realize benefits that we can’t anticipate at this time. That is the nature of international exchanges,” Schneeberger said. Nearing his return to Pakistan, Habibullah says he is ready for a short break from the stresses of graduate school. He did hint, however, that he may return to the country to receive a doctoral degree in a year or two. “I want to go and reflect on my experiences here,” Habibullah said. In addition to reflection, Habibullah says that he is ready to share those skills that he has learned with those who need it. Habibullah defended his thesis on Feb. 16, marking the first scholar of AIP to complete his studies at MU. On March 7, he will be leaving the U.S. and returning home. He says that his time at CAFNR will be fondly remembered.